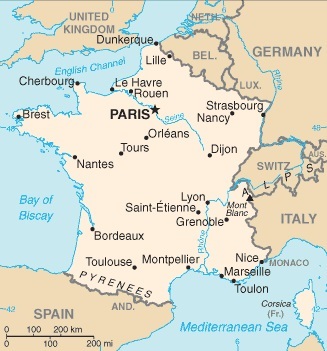 France is a country principally located in western Europe, but also includes territories, islands and regions in other continents around the world. The European part of the country, which is known as Metropolitan France, consists of the mainland and Mediterranean island of Corsica. The mainland has coasts on the English Channel, the Atlantic Ocean, and the Mediterranean Sea, and has land borders with Andorra, Belgium, Germany, Italy, Luxembourg, Monaco, Spain, and Switzerland, as well as being connected to the UK via the Channel Tunnel. The overseas departments and territories of France are, for the most part, island groups in the Atlantic, Indian or Pacific Oceans, but they do have land borders with Brazil and Suriname (French Guiana), as well as the the Netherlands Antilles (Saint Martin). The population of France was an estimated 64,102,140 as of 2007. Of these, 61,538,322 lived in Metropolitan France. The capital of the country, Paris, was the largest city, and had a population in excess of 2.1 million. France is one of the world's leading economic powers, and has a modern developed economy. The country's economy is based around a mix of private enterprise and government intervention, although the amount of government intervention in the economy has been on a gradual downward trend over the last few years. France has traditionally been a strong supporter of European integration, is a key member of the European Union, and having adopted the Euro currency, is a member of Euro zone. 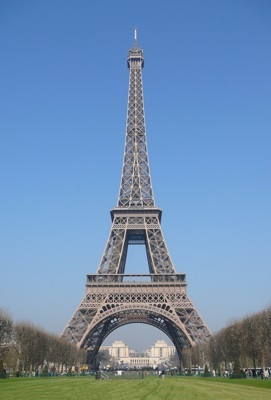 As a tourist destination, France is very popular. There are many historic sites in the country (the capital Paris is particularly noted for its culture and history), as well as excellent beach and ski resorts. With superb photography, illustrations, and maps, this easy-to-use travel guide leads you to the best of France, one of the world's leading destinations for culture, fine food, and wine. This guide will show you the wide range of sights that France has to offer, from the beautiful cities of Paris, Lille, and Nice filled with art galleries and historic sights; the châteaux of the Loire Valley and the remarkable Mont-St.-Michel; to the beauty of the Pyrenees and Alps, Brittany beaches, the glamorous French Riviera, and Corsica's wild landscape. Learn about regional French cuisines and wines, architecture, art, and literature. This "mini-encyclopedia of France" also has practical tips on how to get around, entertainment, shopping, and the best restaurants, cafés, and places to stay. With hundreds of full-color photographs, hand-drawn illustrations, and custom maps that illuminate every page, DK Eyewitness Travel Guide: France truly shows you this city as no one else can. Lonely Planet France is your passport to the most relevant, up-to-date advice on what to see and skip, and what hidden discoveries await you. Grab a cafe creme at a Parisian sidewalk cafe, take in glacial panoramas above Chamonix or explore the Champagne-soaked city of Reims; all with your trusted travel companion. Get to the heart of France and begin your journey now! Wander the lavender fields of Provence, climb the Eiffel Tower, and bite into a perfect croissant: with Rick Steves on your side, France can be yours! Make the most of every day and every dollar with Rick Steves France 2019. Written by locals, Fodor's travel guides have been offering expert advice for all tastes and budgets for more than 80 years. Unforgettable artwork, heavenly villages, and dream cities--there are so many reasons to visit France that deciding where to go and what to do can be a bit overwhelming. Fodor's Essential France takes the guesswork out of choosing the perfect French experiences by compiling the top choices chosen by Fodor's army of France-based writers. This travel guide includes: · Dozens of full-color maps plus a handy pullout map with essential Paris information · Hundreds of hotel and restaurant recommendations, with Fodor's Choice designating our top picks · Multiple itineraries to explore the top attractions and what’s off the beaten path · In-depth breakout features on Provence's fields of lavender, the wine cellars of Champagne, and Mont-St-Michel's medieval glory · Side trips from Paris including Chartres, Versailles, and Monet's Garden · Coverage of Paris Neighbourhoods, Western Ile-de-France, Eastern Ile-de-France, Loire Valley, and Grenoble Planning to focus on just part of France? Check out Fodor's travel guides to Paris and Provence & the French Riviera. Experience France's old-world romance and modern-day excitement for yourself with Rick Steves Best of France! Planning a longer trip? Rick Steves France 2018 is the classic, in-depth guide to exploring the country, updated annually. Looking for a quick getaway? Try Rick Steves Pocket Paris. Make the most of every day and every dollar with Rick Steves France 2018. Lonely Planet’s France is your passport to the most relevant, up-to-date advice on what to see and skip, and what hidden discoveries await you. Grab a café crème at a Parisian sidewalk cafe, take in glacial panoramas above Chamonix and explore the Champagne-soaked city of Reims – all with your trusted travel companion. Get to the heart of France and begin your journey now! The Perfect Choice: Lonely Planet’s France is our most comprehensive guide to France, and is perfect for discovering both popular and offbeat experiences. Looking for more extensive coverage? Check out Lonely Planet’s Paris for an in-depth look at all the capital has to offer, or our Provence & the Cote d’Azur, Brittany & Normandy, and Corsica regional guides. Discover the freedom of open roads with Lonely Planet's France's Best Trips, your passport to up-to-date advice on uniquely encountering France by car. Featuring 38 amazing road trips, from 2-day escapes to 2-week adventures, you can get lost among the snowcapped Alps or taste your way around Champagne's hallowed vineyards, all with your trusted travel companion. Get to France, rent a car, and hit the road! The Perfect Choice: Lonely Planet's France's Best Trips is perfect for exploring France via the road and discovering sights that are more accessible by car. Planning a French trip sans a car? Lonely Planet's France guide, our most comprehensive guide to France, is perfect for exploring both top sights and lesser-known gems. Looking for a guide focused on Paris? Check out Lonely Planet's Paris guide for a comprehensive look at all the city has to offer, or Pocket Paris, a handy-sized guide focused on the can't-miss sights for a quick trip. This easy-to-use guide will lead you straight to the best things to do in Provence and the Côte d'Azur, one of France's most alluring destinations. Whether you're looking to relax in one of St. Tropez's finest hotels, experience the glamour of Monte Carlo and Cannes, or explore the historic Palais des Papes in Avignon, DK Eyewitness: Provence & the Côte d'Azur can help you plan the perfect holiday. Follow carefully plotted itineraries to discover some of the best French Riviera beaches, while insider tips and hotel recommendations will ensure that you make the most of all this breathtaking region has to offer. With hundreds of full-color photographs, hand-drawn illustrations, and custom maps that illuminate every page, DK Eyewitness Travel Guide: Provence & the Cote d'Azur truly shows you this city as no one else can. Written by locals, Fodor's Paris annual travel guidebook offers expert advice and insider tips for all tastes and budgets to help you make the most out of your visit to Paris. Complete with detailed maps and concise descriptions, this travel guide will help you plan your trip with ease. Join Fodor’s in exploring one of the most romantic cities in France and Europe. Paris is an all-time top destination for travelers, and it's easy to see the allure: the experiences - dining, shopping, museum-going, neighborhood strolling - are all legendary. The new Fodor's Paris captures the best of the City of Light, from the masterful cuisine to the sweeping romance of the Eiffel Tower. •UP-TO-DATE COVERAGE: Paris is always changing, and this edition captures the city's hottest new restaurants, hotels, shops, bars, and more. Parisian life, from luxurious finds in Champs-Élysées boutiques to the simple pleasure of the perfect croissant, is covered in dazzling detail. Updated annually to ensure the best and most relevant content. •ULTIMATE EXPERIENCES GUIDE: A brief introduction and spectacular color photos capture the ultimate experiences and attractions throughout Paris. •FULL-SIZE STREET MAPS AND A PULLOUT MAP: A handy take-along map gives you essential information so you can travel with confidence. •ILLUSTRATED FEATURES AND GORGEOUS COLOR PHOTOS: Rich color features help you make the most of the city’s top experiences, from visiting awe-inspiring Versailles to seeing top artwork in the Musée du Louvre. Additional color photos help inspire trip planning. •ITINERARIES AND TOP RECOMMENDATIONS: Sample itineraries help you plan and make the most of your time. We include tips on where to eat, stay, and shop as well as information about nightlife and side trips from Paris. Fodor's Choice designates our best picks in every category. •INDISPENSABLE TRIP PLANNING TOOLS: Paris's top attractions are broken down at a glance, as are the top itineraries and what to do with kids or without. Each neighborhood has a convenient overview with highlights and practical advice for getting around and planning a visit. •COVERS: The Eiffel Tower, the Louvre, the Champs-Élysées, Notre-Dame, Arc de Triomphe, Montmartre, Musée d’Orsay, Sacré-Coeur, Versailles, and more. ABOUT FODOR'S AUTHORS: Each Fodor's Travel Guide is researched and written by local experts. Planning on visiting the rest of France? Check out Fodor’s France and Fodor’s Provence and the French Riviera.